While most high-cost U.S. cities dither over building new housing for their surging populations, the government of Hong Kong is considering building new land. Last week Bloomberg covered Hong Kong Chief Executive Carrie Lam's proposal to build four artificial islands—whose total size would be about one-fifth the size of Manhattan—on which new as many as 400,000 units of new housing could be built, providing homes for up to 1.1 million people. "The shortage of land supply not only leads to a shortage of housing supply, but also affects people's quality of life," said Lam during an October policy address to the Hong Kong Legislative Council, when she first endorsed the idea. The idea for new land as a solution to the island's high housing prices—the highest of any city in the entire world—is an interesting one, and it's hard not to get excited about literally raising islands from the sea. Nevertheless, there are a lot of reasons to think that this land reclamation scheme is a giant boondoggle, the goals for which could be just as easily achieved through the kind of zoning reform cities are normally loathe to embrace. For starters, Lam's new islands would not come cheap. The Our Hong Kong Foundation—which first released a detailed policy proposal for building the new islands in August 2018—put the cost at HK $1,360 per square foot of reclaimed land which works out to be about $32 billion in U.S. dollars, or roughly 10 percent of Hong Kong's GDP. One government source told the South China Morning Post that the land reclamation plan would cost up to $68 billion, while an environmentalist group has pegged the costs at closer to $128 billion. The government of Hong Kong, a self-governing "special administrative region" of China, has not released official estimates. That's a lot of money however you slice it, which only further frustrates those who say the project's aspirational completion date of 2032 won't address the region's immediate and pressing problem of housing affordability. There are things the Hong Kong government could do right away to help reduce the city's astronomical housing costs, including reforming zoning in the territory so that more housing can be built on land that already exists. A large majority of land that falls under Hong Kong's jurisdiction is actually zoned for "green space"—meaning parks, reservoirs, and farmland—and is thus ineligible for housing. Rezoning this green space could open up a lot of new land to development, but it would be incredibly controversial. Much of what has been zoned "greenfield land" has been snatched up by private developers waiting for the government to rezone the land, which would set them up for a tidy profit. That might not matter to libertarians, but in Hong Kong—where developers are not incredibly popular, and where government-funded public housing is the norm—it's politically dangerous. 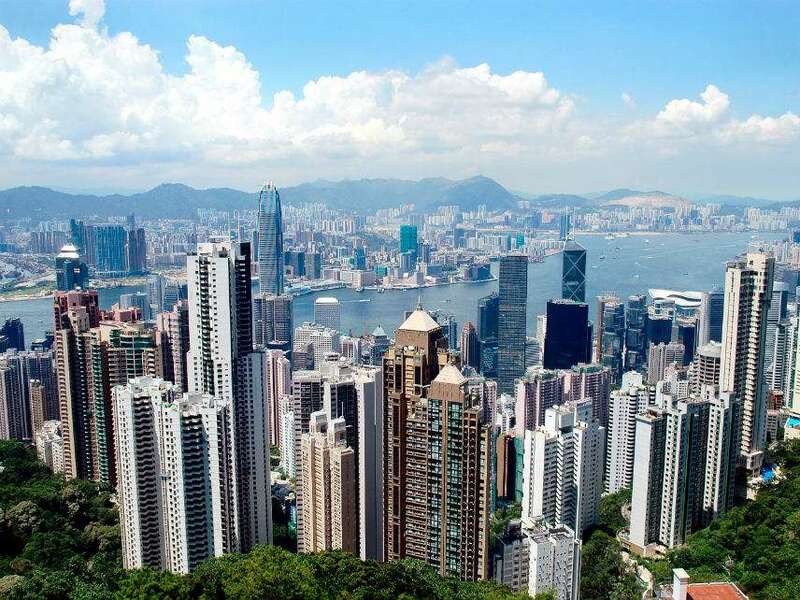 Making matters worse is that even in areas where land has been rezoned to allow for new residential development, the Hong Kong government has shot down many proposed projects, or imposed building requirements that make these projects infeasible. So while building new land is an undeniably cool idea, it's also not the most practical one. The most practical solution to a housing shortage is far more boring, as well as cheaper and faster. I mean, if the housing shortage is bad enough, it might be worth it. As such, just make it legal for private developers to build new islands and if it makes financial sense, they’ll do it. If they’re wrong and they go bankrupt building a island, at least the rest of hong kong society wouldn’t get stuck with the bill. The idea for new land as a solution to the island’s high housing prices?the highest of any city in the entire world?is an interesting one, and it’s hard not to get excited about literally raising islands from the sea. I plan to blame the eroding shorelines from the newly displaced ocean waters around the world on Climate Change. This article is not going to age well. I guess Christian hasn’t heard about the housing bubble in China. They DON’T need these houses since many of them are empty. They’re building them for no good reason. I remember Greenspan used the same reasoning before the US housing market collapsed. I know, Frank obviously doesn’t know much about Hong Kong vs the rest of China. People really really want to move there currently, too much housing is not the issue here, Frank. The artificial demand for housing everywhere in China is driving up prices everywhere in China including Hong Kong. Won’t anyone think of the spotted-assed nasty-fish? Floating islands only would eliminate overcrowding. Its better to allow everyone live closely together so their beloved ruling elites can control and watch them better. However, floating island would be a good idea for the ruling elites. This way they can free from being around all those yukky people, their problems, and their never-ending whining about having more freedom, more money, more independence, etc. Plus the ruling elites would enjoy life a lot more as they, rest, relax and think of even more and better ways to suppress the masses. Maybe pushing telecommuting might be a better answer. The planet is essentially unoccupied, as anyone who has driven long distances on most of the continents can attest to. Hong Kong has its own special reasons for people wanting to pour in… Mainly that it is still allowed slightly more freedom than the rest of China, so people prefer to live there. However in places like America these issues are, IMO, caused mostly by retardation. There is no shortage of land, but a poor distribution of employment. This applies in HK too though. I live in Seattle. I’m originally from the Bay Area. In short, these “trendy” coastal areas have been made unlivable, mostly because of stupid planning by major tech companies. The tech industry has concentrated its workforce into fewer cities than ANY other major industry in recent memory, the auto industry in its heyday MAYBE being excepted. This has driven up the cost of living to the point where they tech companies have had to increase employee pay dozens of percent above what they COULD hire people for elsewhere, and it’s STILL not enough to actually give their employees comparable lifestyles as in other parts of the country. If they had spread their employment around more, like other major companies do, none of these problems would have arisen. There’s no reason there shouldn’t be 20K programmers in Chicago, or Atlanta, Dallas, etc. They could easily find employees to work in other metros, and could have avoided screwing up their own bottom lines, AND screwing their employees. The only reason I can figure that the CEOs of these tech companies did this is outright stupidity, or assuming their employees, who make 1/10,000th what they do, actually DEMAND to live in these places, despite knowing they’ll have a garbage standard of living… But knowing many such people personally, a great many of them RELUCTANTLY moved to these places because they simply couldn’t find jobs in the part of the country they’re originally from. It FINALLY seems in the last few years that the tech companies “got the memo” that they MUST start hiring elsewhere. There is simply no more room physically in these places, or fudge room in jacking up wages to make up for yet higher cost of living increases further hiring would cause. Big tech is opening up more campuses in major cities now… The sad part is that they didn’t do this common sense thing 10-15 years ago. I think this alone may well cause a massive real estate collapse in several tech heavy cities, given that they’re way beyond where fundamentals say they should be, and NEVER would have gone so high without the massive hiring figures in short spans of time. I guess it’s better late than never. If China simply made the mainland less fucked, HK wouldn’t be having these problems either, as people wouldn’t feel the NEED to be just in HK. If I owned google, I’d buy a 10 square mile plot of land in central Kansas and build a completely planned community. I’d start in the center with 3 cities of 5000 people with the intent of building 55 cities of 5000 people each on alternating 2 mile centers. I’d build the cities with the homes on the perimeter and businesses and parks in the center with covered slidewalks connecting the whole thing. Between each city I’d have a reasonably speedy rail system, some agriculture, and huge open spaces. The rail wouldn’t have to be all that fast since the longest straight line distance between cities would be 14 miles and each city would be 2.8 miles away from the cities nearest it. Each city could develop it’s own culture. It would be trivial to visit any of the other 55 cities or commute to jobs wherever they are located in the 100 mile square. I’m not a fan of the Kansas geography, but I would move to someplace like that in a heartbeat. If the land was all privately held by the company, covenants could keep the authoritarians in check, though of course the company would end up being the ultimate authority. At this point it couldn’t be any worse than our Federal government. That would be one way to do it! Obviously it doesn’t have to be as extreme as your suggestion, but the reality is that the BIG guys have the power to build wherever the hell they want. They have intentionally passed on lowering their labor costs considerably by only operating in overly expensive cities. If I were a large shareholder in Google, I would have sued them YEARS ago for a breach of fiduciary duty. The CEOs claim they do this because all their employees ONLY want to live in hip coastal cities… Where they can barely afford a 400 SqFt studio, despite making 6 figures… But I know tons of programmers, and a lot of them have been quite adamant they didn’t WANT to come to Seattle. Many more would consider going somewhere else if they got more bang for their buck. IMO it has been a major breech of civic duty (to the extent libertarians accept the concept), and a bad business decision to boot. They REALLY need to open more campuses. It will have a massive positive effect on the US economy. Building made up paper wealth in real estate is NOT the same thing as spurring actual real growth, and increased REAL standard of living. That there are millions of people who are now having their real standard of living essentially cut in half, all because of artificially inflated real estate prices, is ridiculous. If they had spread the lovin’ around, all these people would have been able to have nice houses, and far more expendable income to spend on other consumer goods, which would have juiced the economy a TON. Instead all we have to show for it are real estate bubbles that will eventually pop in the top dozen or so trendy metro areas in the US.